Axl Rose and Beyoncé have something in common — a will to obliterate unflattering internet photos. The Guns N&apos; Roses frontman has demanded Google take down unbecoming images of him — most of which ridicule his weight gain. But as the law of memeification goes, no celebrity weight gain goes unmemed. Even the pregnant aren&apos;t left unscathed. There are at least 11 Digital Millennium Copyright Act takedown requests made on behalf of Rose to Google in Harvard University&apos;s Lumen Database. Rose sees your fat-shaming digital altering work and raises you a copyright infringement. The original image (pre-meme) of Rose in a red bandana first appeared in the Winnipeg Free Press in January 2010, TorrentFreak reported. Photographer Boris Minkevich took said photo, but the company Rose used to make the DMCA takedown requests reports otherwise, saying that all accredited photographers at Rose&apos;s shows sign a contract that transfers copyright ownership to Rose&apos;s service company. Minkevich told TorrentFreak that some shows do make you sign contracts, but the event at which he took the photo was a long time ago, so he couldn&apos;t say with certainty whether he signed a contract. The takedown requests date back to May 31 on the database, but it looks like the Rose fat-shaming crusade started weeks before that on Twitter. Creative consultant Kam Pashai said in a Twitter DM that the photo he posted, "the usual Axl photo that&apos;s getting taken down," was removed around May 20. It wasn&apos;t a meme, just an unflattering photo. Is a meme a fair use image? Maybe. As Art Law Journal points out, the fair use doctrine does make a few exceptions, including parody. "Even if a meme were to be viewed as a satire, it could show it merited fair use according to other prongs of the doctrine (for instance, if it can be shown that a consumer could never mistake the meme for its original commercial substitute), and therefore could likely pass the fair use test," Art Law Journal wrote. It&apos;s not just negative memes that are being taken down. 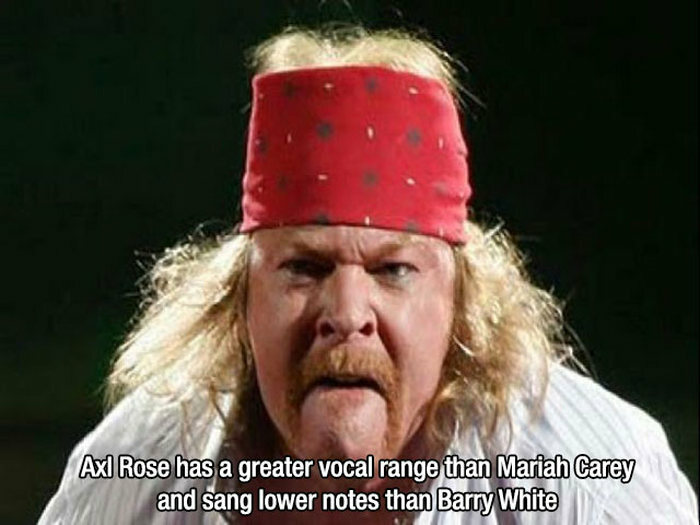 While most mock his weight gain ("Take me down to the bakery city/ Where the pies have cream and the cakes are tasty"), one image cited in the takedown requests actually has a favorable message — "Axl Rose has a greater vocal range than Mariah Carey and sang lower notes than Barry White." But even a compliment must be destroyed if it&apos;s plastered on an unfavorable close-up. We have reached out to Google and Twitter for comment.